Día de los Muertos (“Day of the Dead,” running from October 31 to November 2) is an annual holiday celebrating the souls of those who have passed on. Particularly for the people of Mexico and Central America, and for Mexican-Americans in the United States, it is a day to welcome the return of spirits of the dearly departed. This multi-day event focuses on gatherings of family members and friends to take part in traditional customs, including building ofrendas (altars), candle-lighting and face-painting. Decoration: Sticker gems, decorations, glitter glue, etc. Directions: Using graphic design software, you can design your own image to put onto a pillar candle, honoring someone important to you and your community. Using one of the suggested graphic design softwares, create a new file that is approximately 6”x5”. This is the image that will be printed and wrapped around your pillar candle. 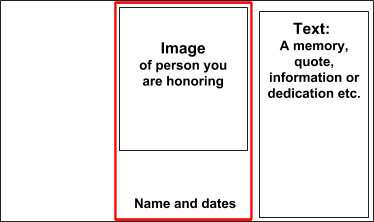 Next, makers can either download or scan a digital image of the person they want to honor. Makers conduct an image search and download higher quality images so that images do not print pixelated from low-resolution versions on the web. Next, makers save the images from the web to the desktop and rename the file to use in the graphic design software. Now open the image in the graphic design software and cut/paste or copy/paste the image into the new file that was created earlier. Edit and modify as necessary. Explore the tools in the software, and remember that Control+Z always undoes the last action. Print file on color printer and affix to the pillar candle. Finally, makers can place their pillar candle on a community altar, and share with others their research, stories and information on the person they have chosen to honor. This project encourages makers to create an illuminated paper marigold for a community Día de los Muertos altar. This is an opportunity to learn some basic electronics while also participating in a community cultural event. “Day of the Dead” celebrations often include an altar or shrine dedicated to the souls of the deceased. On October 30 or 31–even earlier in some homes, la ofrenda will be set up in many Mexican households to ensure that it will be ready by November 2. The traditional ofrenda usually consists of a table adorned by a cloth and decorated with fruits, flowers, vegetables and many other objects. Many ofrendas often incorporate a sky or cielo. The sky is a sheet suspended above the ofrenda or a string of colorful banderitas de papel picado (paper cut out flags). A photograph of the deceased, religious statues, pan de muerto, images of saints, candles, and a glass of water, incense and cempasúchil flowers are also important elements of the ofrenda. Making your own LED Paper Cempasúchil: Using a 3-volt coin cell battery and LED light bulb (light emitting diode), makers use a simple circuit to create an illuminated cempasúchil (mexican marigold). 1. Attach the long leg of the LED (+) to the positive (+) side of the battery and the shorter leg of the LED (-) to the minus (-) side of the battery. The LED should now be glowing! (You can see a demo on the first 30 seconds of this video.) Next, tape the LED to the battery snug with electrical tape. Set this aside while working on the flower in the next step. 2. Layer up 6-8 pieces of 5”x5” tissue paper. Start folding the layered squares from one side back and forth in 0.5” rows in accordion style or zig zagged, like stairs. (Do not wrap into itself). 3. Next, in the middle of the folds, place the taped battery and LED so that the glowing LED if facing up. 4. Wrap and twist the pipe cleaner around the middle, securing both the battery/LED and the folds of the paper. 5. Cut the folded ends of each side of layered paper into a rounded shape. This will create the petal shape of the flower. 6. Now, open up the folds on each side. At this point, it should look like butterfly wings, with the LED glowing in the center. 7. Carefully and gently separate the individual layers of tissue paper on each side, opening up the flower petals to look like a 3D cempasúchil (marigold). The petals can be arranged to beautifully diffuse the light of the LED in the center. 8. Finally, place the LED cempasúchil onto the community altar, sharing with others the research, stories and information on Día de Los Muertos, and the people that your community chose to honor. ¡Diviértanse! Mary Jo Madda (@MJMadda) is Creative Strategy Manager for several diversity + education initiatives at Google, including Code Next and Tech Exchange. Previously, she was a Director at EdSurge. The viewpoints expressed in this article are theirs and do not represent those of their employer.